Narcos episode seven, You Will Cry Tears of Blood, begins with the actual news coverage about the assassination attempt that was depicted at the end of the previous episode. Through the fallout over Avianca Flight 203 we observe the Colombian nation assess the damage done to their country. Rewind back to the first half of the season when Pablo Escobar was viewed as a man of the people. He was a charitable, humanitarian in Colombia. Then in the third episode due to American intrusion, on Colombian affairs, the law of extradition was passed. In response the once beloved Pablo Escobar has taken his frustration, with the Colombian political system, out on his own fellow countrymen. 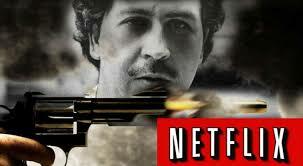 One hundred and seven innocent lives were taken during Pablo Escobar’s failed assassination attempt on César Gaviria. The media’s speculation about the mysterious plane bombing points the finger at Pablo Escobar and he is again forced to cut all ties with the bombing by any means necessary. This includes a violent raid on the safe house where Natalie, the plane bomber’s wife, is being kept. 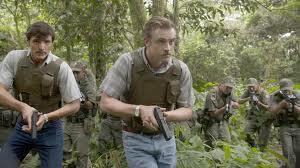 Murphy and Peña race towards the end of the episode to protect Natalie from being killed by Pablo Escobar’s men. The footrace between these opposing sides is filled with superb tension. One moment that really stands out is when Javier Peña has cornered one of the bad guys, only to then have a young boy threaten to shot him. On the surface the screen shows the haunting image of a child with a gun. Therefore alluding to Colombia’s societal deterioration during this civil war. In addition, there is an added layer to this scene as Peña finds himself caught in a moral catch twenty-two. He could shot the kid to catch his bad guy, but that would cost Peña, his moral high ground that he holds against Pablo Escobar. On the other hand, Peña puts down his gun and allows the bad guy to get away once again. Back in episode three Javier Peña and Steve Murphy made sure that both the American and Colombian government’s focus would remain on the investigation of Pablo Escobar. In a sense, they started wanted this war, but now in the midst of it, how far are they willing to go to win the war? Narcos episode eight, Le Gran Mentria, begins with another failed attempt at capturing Pablo Escobar and his men. Throughout both episodes, seven and eight, Pablo Escobar has begun to place pressure on the Colombian government to appeal the law of extradition. The pressure amplifies when Pablo Escobar and his men take hostages, including journalist Diana Turbay, to use as leverage for a fair negotiation with President César Gaviria. 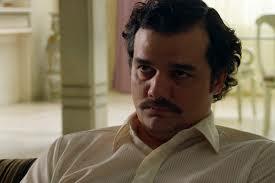 During a conversation between Diana Turbay and Pablo Escobar, his character motivations are expounded upon. The most insightful part of this exchange is given through Turbay’s response to Pablo Escobar’s self-justification for his violent means, “You would have done marvelous things and that is the saddest part.” This series chronicles the investigation of Pablo Escobar, but more importantly it illuminates the specific circumstances that made both his rise and fall possible. The “saddest part” is that Diana Turbay becomes just another casualty in this war, as she is killed during another botched raid. This incident allows the Colombian support to ebb back to Pablo Escobar’s favor, as they demand that President Gaviria concede to Pablo Escobar, before more blood is spilt on their Colombian streets. “Lies are necessary…when the truth is too difficult to believe, right,” explains Pablo Escobar as he surrenders himself over to the Colombian officials. Le Gran Mentria in Colombian means the great big lie, which is essentially what Pablo Escobar’s “surrender” is because he still got everything that he wanted. He will go to a prison that he built; with guards that he pays; most importantly the law of extrication was appealed. Only in Colombia would a drug lord make a grand return to a grateful country, but that’s where we started, right? Colombia is the homeland of magical realism. In the pilot we witness Steve Murphy receive information about the whereabouts of Pablo Escobar’s men. 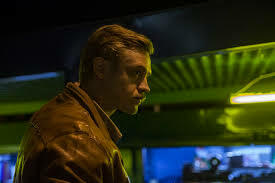 Then Murphy calls in a police raid led by Javier Peña. This is a successful mission as Peña and his men kill Escobar ‘s associates, but the also take the lives of innocent civilians. This same scene is revisited during the end of episode eight. Again, Narcos proves that this series expounds upon the Colombian circumstances involved during the rise and fall of Pablo Escobar. The rise and fall spurred by the moral shifts on both sides.